Feb. 12, 2019 3:37 p.m. The shadow of a new Cold War hung heavy Tuesday as the commander of North America’s early-warning system urged Canada and the U.S. to get on with upgrading the continent’s aging defences in the face of growing threats from Russia and others. The Russian military has been developing new nuclear-armed cruise missiles that are difficult to detect and intercept and hypersonic missiles whose special threat is their extreme speed compared with older weapons. Russia has also been sending bombers to buzz North American airspace in the Arctic, resumed fighter-jet patrols in the area after a 30-year hiatus and deployed cruise missiles on naval vessels in its northern waters, O’Shaughnessy said. The Canadian and American militaries have been quietly contemplating the future of Norad as new technology threatens to make the missile-warning system, which includes a chain of 1980s-era radars in Canada’s Arctic, obsolete. Yet any progress has been muted, as officials on both sides of the border repeatedly reference the need for study and evaluation that will feed into future discussions — whose dates still haven’t been set. O’Shaughnessy acknowledged the need for study to ensure Canada and the U.S., which have worked through Norad to defend against nuclear-missile attacks since the 1950s, build the right system to defend against 21st-century threats. But he warned against falling into what he described as “the paralysis-by-analysis trap while our competitors are putting us at risk with credible threat. O’Shaughnessy’s remarks came less than a month after the U.S. Department of Defense released a long-awaited review of the threats posed by Russian, Chinese, North Korean and Iranian missiles — and the ways to counter them. Both U.S. President Donald Trump and the Pentagon report put a heavy emphasis on space-based sensors and defences to detect, track and stop missile attacks against the U.S. and its allies from anywhere in the world. Trump also warned that allies will have to pay their share for the new capabilities, which some analysts have questioned will ever become a reality given their potentially high cost, widespread concerns about the weaponization of space, and the unproven technology. One of the questions facing any upgrade to Norad will be whether Canada finally agrees to participate in a missile-defence shield program, which involves intercepting incoming attacks, after famously opting out of one such program in 2005. O’Shaughnessy did not mention missile defence in his address. The Liberals have left the door open to eventually joining such a program as part of a modernized Norad, while the Conservatives have openly called for Canada to join now. Government officials have acknowledged that Canada could end up paying billions to upgrade or replace northern radars, money that isn’t now accounted for in the Trudeau government’s multibillion-dollar defence policy. 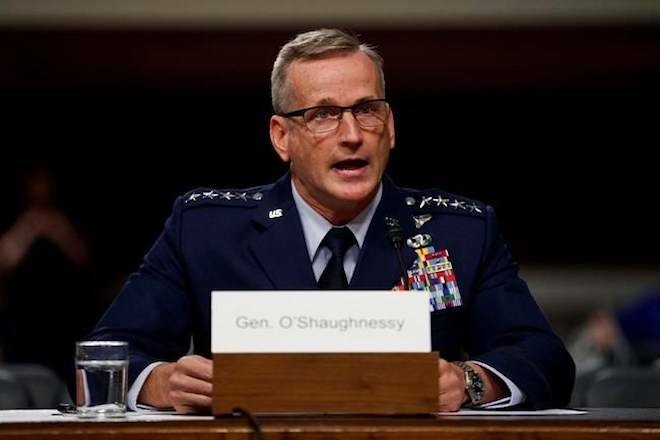 While O’Shaughnessy is responsible for Norad, he also said that Canada and the U.S. need to better defend shared infrastructure such as power grids while finding ways to make it too dangerous for anyone to contemplate an attack on North America.